SoSecure Containment Brief. Enjoy swimming again. Mary is an active grandmother who loves getting in her backyard swimming pool with her 6 grandchildren. She had always enjoyed the warmer weather and being in the water but now it was even more special because she could share her pool with her grandchildren. She loved inviting them over one at a time for some special swim time with Grandma or having them all over at once. However, when she was diagnosed with incontinence her first thought was the loss of this special time.. How could she get in the water? How could she keep her grandchildren from knowing what she was dealing with? What would she say? She was overwhelmed and sad at having to give up swimming until she found out there was a solution which would allow her to keep enjoying her pool and the people she loved the most! Today, there is no reason to sit out at the pool party. There are incontinence supplies which can allow anyone who is dealing with incontinence to still be able to enjoy the water both comfortably and discreetly. One of these incontinence products is the SoSecure Containment Brief. The SoSecure Containment Brief is offered by Discovery Trekking Outfitters. They are committed to making and offering incontinence products that can make a difference. This type of adult diaper is known as a swim diaper. The SoSecure Containment Swim Brief is a ground breaking design which focuses on comfort as well as durability and function. Both health care workers and caregivers all over the world recommend this swim brief. If you are dealing with incontinence but don’t want to give up swimming the SoSecure Containment Swim Brief can let you continue on enjoying water activities while managing your incontinence. Here are 3 features why choosing the SoSecure Containment Swim Brief the right incontinence product for you. ● The SoSecure Containment Swim Brief comes in a range of sizes. The makers of this incontinence product understand fit is vital for protection when it comes to incontinence supplies. Whether you are a teen or a full sized adult there is a size which will offer you both fit and protection. With such a wide range of sizes there is no need to worry about having to deal with an ill-fitting incontinence product. The SoSecure Containment Swim Brief is easy to wear. ● The SoSecure Containment Swim Brief is easy to wear. This swim diaper is a washable incontinence undergarment which is made to be worn next to the skin under a swim suit. Because of this it is crucial to choose the right size since the close fit will provide the highest level of protection. If you are wearing any incontinence supplies that do not have the right fit then you are risking leaking and accidents. If you are unsure as to how to measure for the right size please check out our How to Measure page. The SoSecure Containment Swim Brief is also easy to put on and take off with velcro closures which offer fully adjustable sizing which opens up flat. This makes changing much easier than other incontinence products of this type. ● The SoSecure Containment Swim Brief is made from the latest technology. 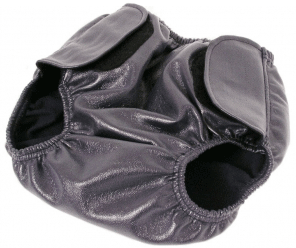 This swim diaper is made from high tech stretch polyurethane fabric with soft fleece lining. This means even with such a close fit you won’t have to worry about feeling uncomfortable. In addition, elastic is added at the waist and legs for added security. The velcro tabs offer the highest level of security so you can be assured you are swimming with discretion. Whether you want to just enjoy swimming or need aquatic therapy there is no reason to give up being in the water because of incontinence. The SoSecure Containment Brief can offer you superior protection and peace of mind. You can find more information about this innovative incontinence product at SoSecure Products.